On-board video from racing at the Bonneville Salt Flats on my dual-engine 1955 Triumph, Double Vision, back in September. 30mph gusting crosswinds, which is why the horizon gets all crooked. No records were set this time, but major changes taking place this winter for the 2015 season. Stay tuned! 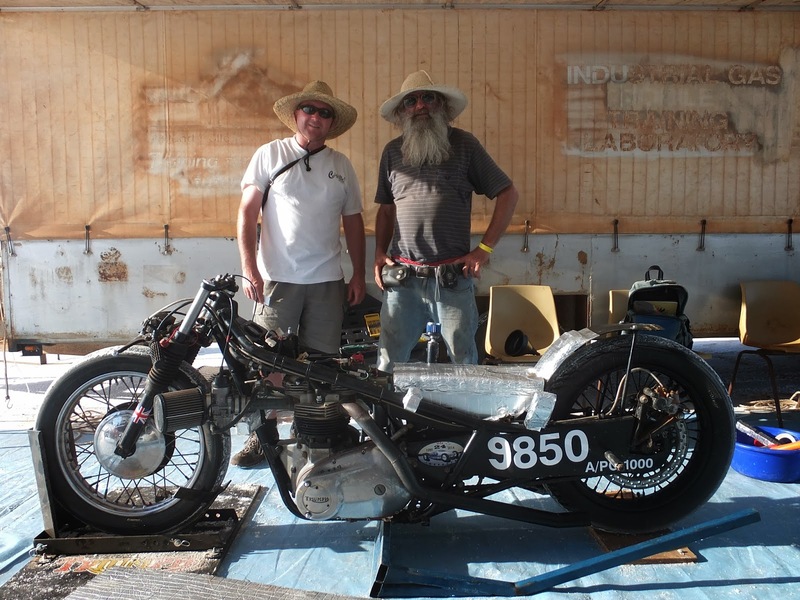 We met our friend Phill Eggleston (the bloke with the beard above) at Bonneville Speed Week in 2010, I believe it was. Phill is an Aussie who races his Triumph Bonneville (slightly modified) at Speed Week Down Under at Lake Gairdener, South Australia. Having just completed their event, Phill came back with some fine results! Looking forward to seeing Phill again this year at Speed Week 2014! A Bit Delayed... Double Vision Race Results 2013! Fellow Redliner Bill Anderson has been verbally abusing me lately about having not ever put up my personal race results from Bonneville Speed Week 2013 on my dual engine 1955 Triumph, Double Vision. Speed Week 2013 was almost a perfect week, with a top speed of almost 153 mph and smashing two records. An APS-VG big twin flathead record of 128.241 was upped to 140.210 mph, and I continued gearing taller and tuning and upped an APS-VF Knucklehead record of 135.438 was upped to 151.448 mph. I qualified for a third record but had to pull out on the back-up record run due to salt clogging the main jet in one of my carburetors. I aim to break 160 mph on gasoline in 2014. Double Vision toured the USA with Triumph Motorcycles, going to all the IMS Motorcycle Shows. Now back in my care, I am just beginning work to make changes to result in higher speeds for 2014, so stay tuned for updates! 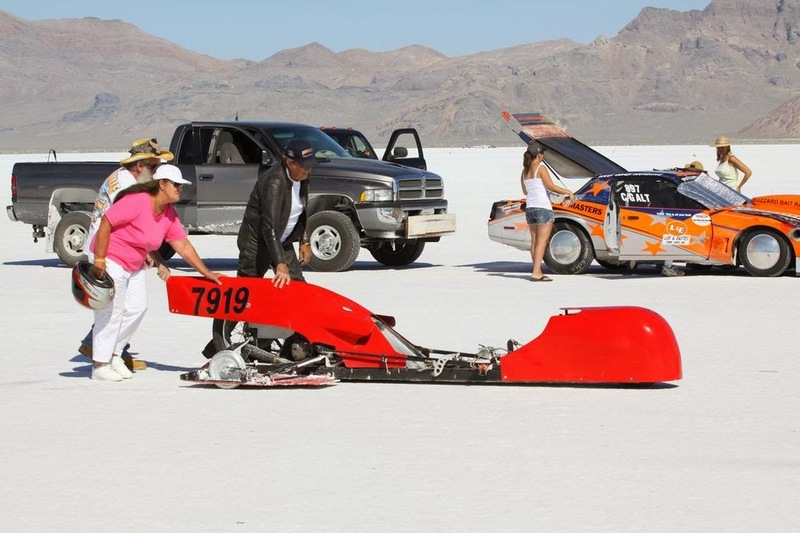 A few photos from Bill Anderson of California from Bonneville Speed Week 2013. 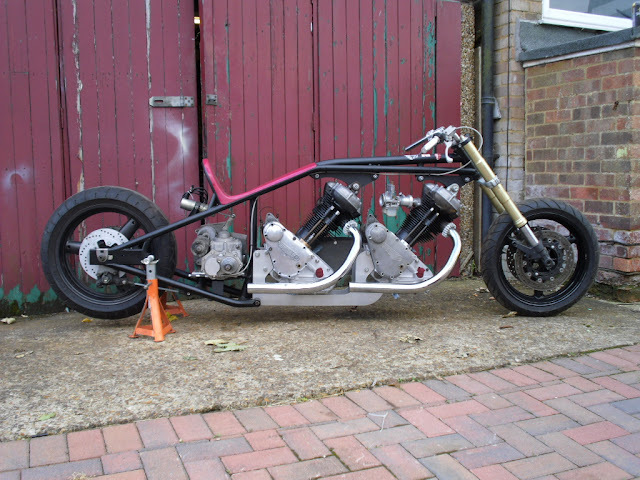 Bill set yet another record with his 650cc Weslake-powered sidecar bike, 121.553 mph in the 650 SC-PG class. 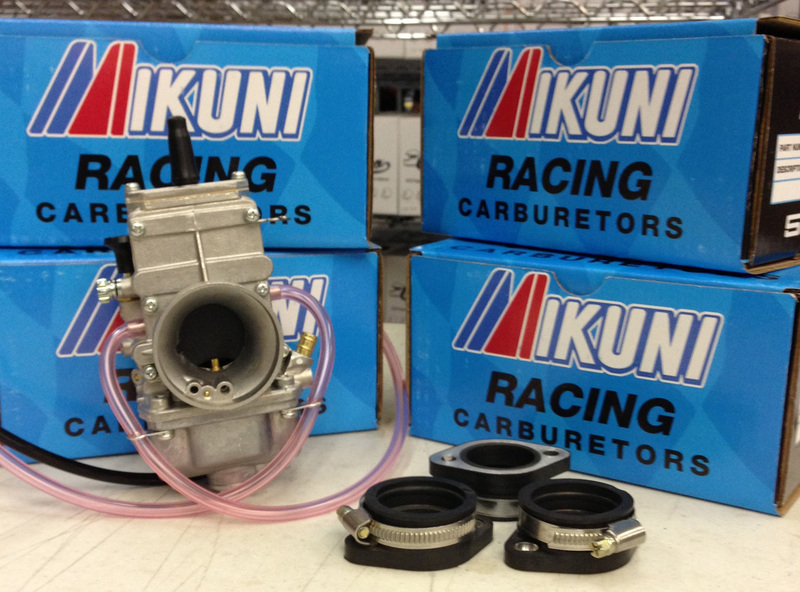 Bill has some tricks up his sleeve and is currently preparing for the El Mirage season opener in May! If anyone wants to get Bill a birthday gift, perhaps a bigger shelf for all of his trophies? 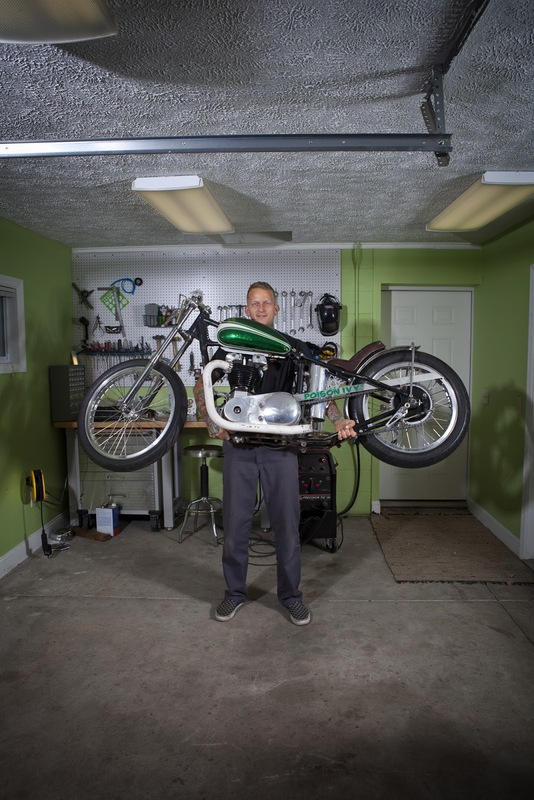 World Finals is coming up October 1st at Bonneville, and with some luck and plenty of time and elbow grease this bike should be ready to run, complete with new sidecar. 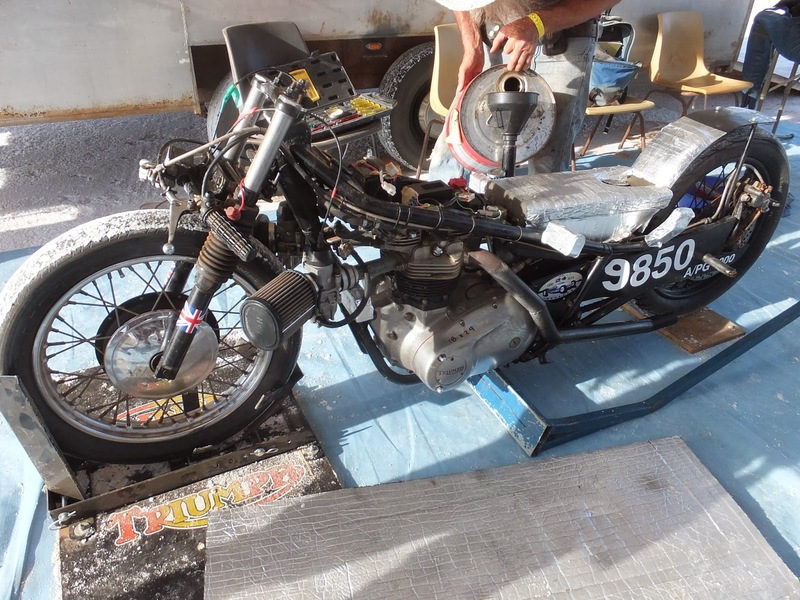 And hopefully my dual engine Triumph, Double Vision, will also be ready to race again, having just set two records at Speed Week 2013. Stay tuned. It is important to maintain other interests in life aside from motorcycles so you don't end up a crazy hermit, with only machines for friends. Working out is one option, see photo above. 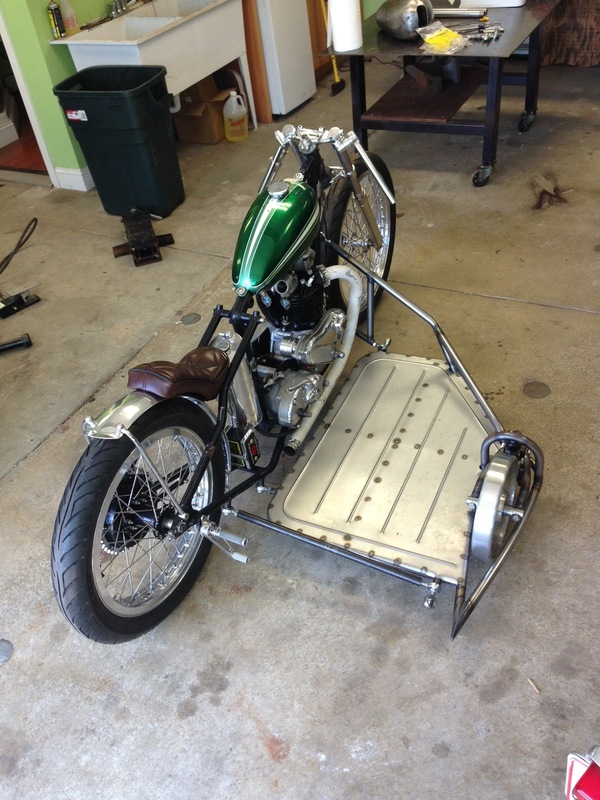 I have been working many of my evenings lately on getting Double Vision, my dual-engine 1955 Triumph, and Poison Ivy, my single-engine 1955 Triumph, rebuilt and race-ready for SCTA Bonneville Speed Week 2013. August is coming up quick. 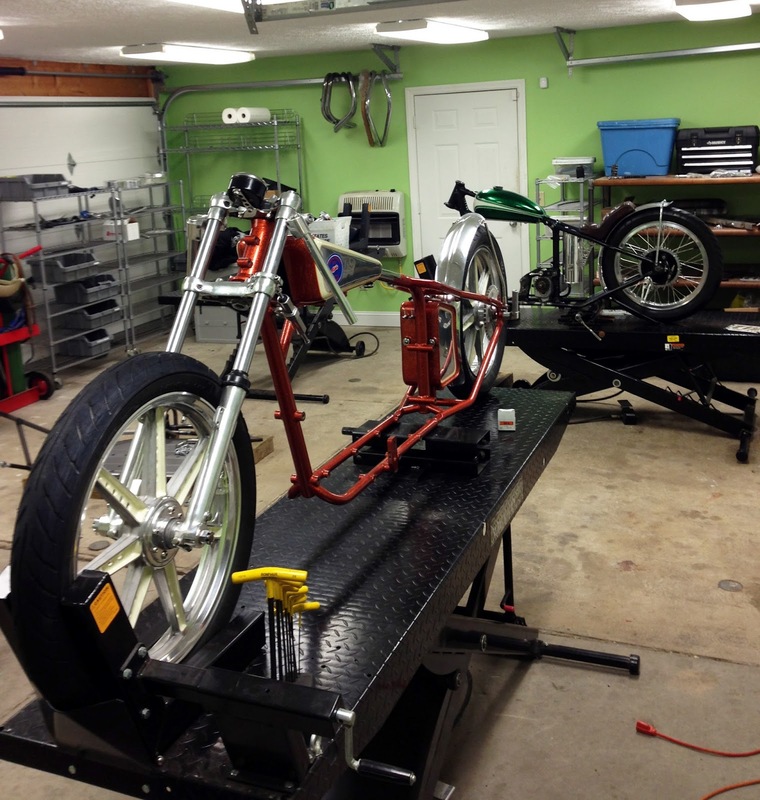 Both bikes have been totally disassembled, many components modified, rebuilt, or beefed up, and all 3 motors have had modifications. Double Vision is going together for the final time as soon as the heads get back on the motors, Poison Ivy is getting built up to fit the new sidecar and then torn back down for powder coat before final assembly. Breaking news, this just in: Bill Anderson has finished preparing his world record holding land speed sidecar motorcycle 'Screwball' for the 2013 El Mirage and Bonneville race season. New bodywork and sidecar aim to smash previous bests. Despite a lot of safety wire, some still say they worry about Bill having a screw loose, but we Redliners have top confidence in our compatriot. Some more photos of Phil & his Triumph 750 c.c. from Lake Gairdner, Speed Week Down Under 2013. 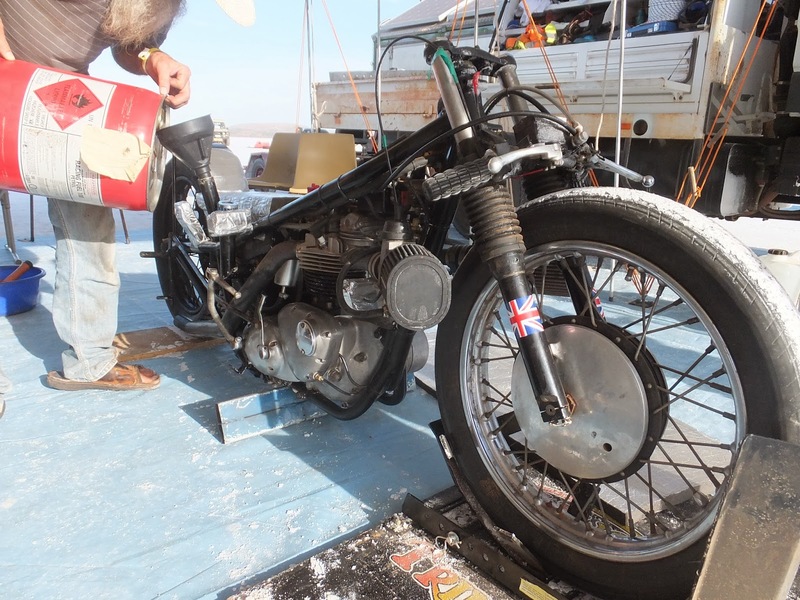 Phil piloted his reverse-head Triumph to 135 mph this year, none too shabby. Hope to see you in August, Phil! Sumo got his primary and clutch setup together on his dual engine Panther. Here is a shot of it outside of the shed. Getting close!